Many investors think of themselves as fundamental investors. They analyze a company’s earnings, dividends and other numbers they find on the financial statement. Then, they develop ratios to place those numbers into context. For example, the price to earnings (P/E) ratio is a normalized value for the earnings. Without this ratio, there would be no way to compare companies to each other. Earnings, on the financial statement, are usually expressed in millions of dollars. One company might report earnings of $1 million or $1 billion. Another might report earnings of $100 million. These numbers, on their own, don’t tell investors much. So, by convention, they convert them to earnings per share (EPS), dividing earnings by the number of shares outstanding. In doing that, we may find the larger company reports EPS of $0.50 and the smaller company reports EPS of $1. To directly compare these values, investors developed tools like the P/E ratio which compares the stock price to earnings. Now we have a normalized way to compare the value of different stocks. Obviously the value of the EPS depends on the number of shares. This information is also available in the financial statements. But, investors might need to dig into the footnotes of the statements to determine how many shares are actually available for trading. This can be especially important for companies that recently went public. While the number of shares available for trading is rarely a number that investors focus, there will be times that it is. That is the case in Snap Inc. (NYSE: SNAP) right now. Last week, Snap reported that it had about 680 million shares available for trading. As of Monday, early investors including Lightspeed Venture Partners could sell up to 400 million shares, with employees owning another 782 million that can start selling on August 14. That will be just, four days after Snap reports results. Selling by employees could be prudent, at any price. If Snap were to fail, their incomes would be at risk. Holding shares of the company risks their investment accounts as well. To diversify, many employees may sell at least part of their holdings when they can. Many of these employees will have a low cost basis for their shares. It is possible they will have acquired shares for a price of about $2. They may be tempted to take the large gain available to them rather than risking additional losses if the company fails to deliver. Before the end of the month, there will be more than 1.1 billion shares available for trading, and that increased supply is likely to be bearish for the stock. It is likely traders have already been selling in anticipation of this news, which has been fully disclosed since the stock began trading. It is common for investors to experience a period of time after an initial public offering when they are unable to sell a stock. These are called lock up periods and lock ups can result in dramatic price moves. For example, Twitter Inc (Nasdaq: TWTR) fell about 18% after a key lockup expired after its IPO in 2014. Snap’s potential similarities to Twitter extend beyond the potential selling associated with the end of the lock up period. Traders have been selling SNAP, as they did TWTR after it began trading, on concerns about user growth and earnings. These concerns prompted Morgan Stanley cut its estimates for Snap’s 2017 revenue by 6.9% to $897 million. The analysts also lowered expectations for growth in the number of daily active users to just 1.6%. Valuation concerns mean the stock might not be on the buy list of value investors. It also will not be on the buy list of index funds, a significant concern that a source of demand will not be there as the supply of the stock increases so much. When SNAP came public, the company sold a class of shares that had no voting rights. Other companies had limited voting rights of shareholders but SNAP took this trend to an extreme. Index providers were pressured to consider corporate governance in their decision on which stocks to include in indexes. S&P announced a new rule on Monday saying that companies with multiple classes of shares will not be able to join several of the company’s indices. The new rule excludes companies with multiple share classes that are already in an index, like Alphabet and Berkshire Hathaway. S&P made the rule to discourage companies from limiting the voices of their shareholders through limited voting rights and “other governance issues” the company said in a news release. The rules will affect the S&P 500, as well as the S&P MidCap 400 and SmallCap 600. This move by S&P mirrors an earlier decision made by FTSE, the provider of the Russell indexes. These decisions are bearish for Snap because it means trillions of dollars invested in index funds will not be buying the stock. All of these concerns are weighing on the stock while two important dates loom. SNAP is expected to report earnings on August 10 and employees are able to sell hundreds of millions of shares the next week. This could push SNAP to new lows. For this situation, where bearish pressures point to a potential decline in the stock, a bear put spread can be used. The risks and potential rewards of this strategy are shown in the diagram below which is from The Options Industry Council web site. 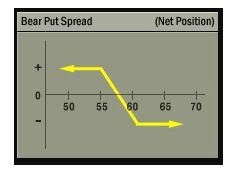 The bear put spread consists of buying one put and selling another put, at a lower exercise price, to offset part of the upfront cost. The spread generally profits if the stock price moves lower. The potential profit is limited, but so is the risk should the stock unexpectedly rally. Managing risks is especially important with a volatile stock like SNAP. 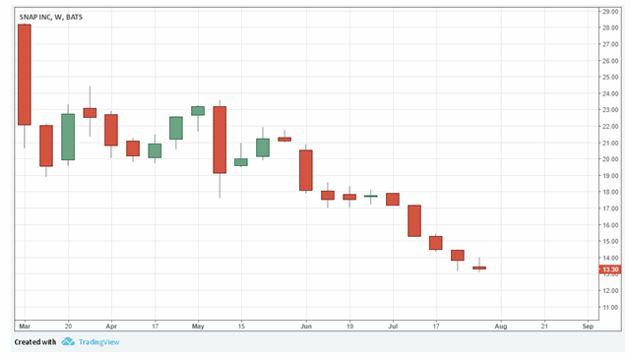 For SNAP, a put with an expiration date of August 11 and an exercise price of $13.50 can be bought for about $1.10. The cost of this trade can be reduced by buying a put expiring on August 11 with an exercise price of $12 for about $$0.50. This trade will cost a total of $60 to open since each contract covers 100 shares and the $110 purchase price of the first option will be reduced by the $50 in income from the option being sold. The potential gains on the trade are limited to the difference between the exercise prices of the options minus the amount paid to open the trade. In this trade, the difference between the exercise prices is $150. The maximum potential gain is then $90, or $150 minus the $60 spent to open the trade. The potential loss is limited to the amount paid to open the position, or a total of $60 for this trade. That ignores the cost of commissions which should be limited to a few dollars at a deep discount broker. This makes the possible gain a return of 150% on the amount risked. SNAP is likely to be volatile through its earnings report and for at least week after that. This trade provides a way for small investors to benefit from that potential by risking a small amount of money.